It is the far future, in the year 2345 of a new calendar - two thousand years, that is, after the dawn of the space age. After centuries of peace, the people of Earth have lost the technology they once possessed and forgotten that they once traveled in space. But a lost tribe of lunar settlers, the Moonrace, have retained the scientific arts... and now they regard their mother planet with envious eyes. Hoping to return to their ancestral home, the Moonrace contact Earth`s feudal lords and attempt to negotiate the transfer of a chunk of the planet`s territory. But soon, unable to make a deal with Earth`s rulers, the Moonrace decide to seize the land they desire by force. Anticipating an extraterrestrial invasion, Earth`s feudal lords organize militias armed with cars and biplanes to do battle with the Moonrace`s army of giant two-legged war machines. Caught in the middle of this war of the worlds is a youth named Loran Cehack, who finds a mysterious artifact - a relic of Earth`s forgotten space age - entombed in stone. 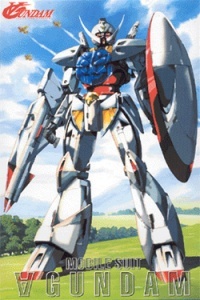 Will this ancient mobile suit enable Loran to avert the conflict and make peace between Earth and moon?